Artist interpretation of a close binary star system in which several planets orbit the brighter star. The fainter companion star looms brightly in the sky (upper right). A recent investigation confirms that the presence of a stellar pair does not interfere in planet formation. 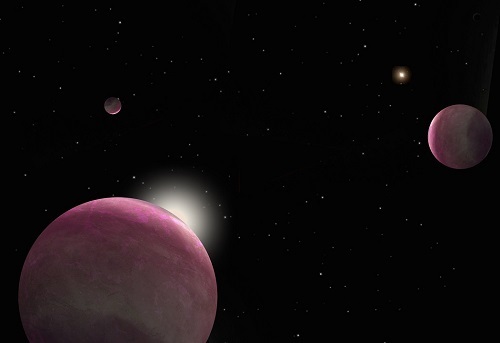 The study finds that approximately half of the stars harboring exoplanets are binary. Image credit: Robin Dienel, courtesy of the Carnegie Institution for Science. Until recently, astronomers generally focused on single exoplanet host stars, believing that planets form primarily around lone stars like our Sun. However, the research led by Matson, who’s team observed 206 star systems, demonstrates that the influence of a neighboring star does not appear to deter planet formation. The presence of a very close neighboring star produces enormous collateral effects on a planetary system, possibly ejecting planets into interstellar space, or gravitationally interfering with their formation and orbits. “In our sample we did not find evidence that the proximity of a companion star suppresses the formation of exoplanets, even at distances as small as 50 Astronomical Units, which is similar to the distance between the Sun and the edge of the Kuiper belt,” explained Matson. The researchers used observations from the Gemini North and South telescopes, and the WIYN telescope using the Differential Speckle Survey Instrument (DSSI), for the high-resolution imaging of the K2 stars. The paper is accepted for publication in The Astrophysical Journal. A preprint of the paper can be found here.